Summers are noisy in Tsukuba. One evening last month (July) the cacophony around Tsukuba Center actually had me scared. I stepped out of the Okura Hotel’s lobby and out onto the road. In front of me stood the soon to be completed Joyo Bank building. The cicadas (semi) were chirping and droning, making me feel that I had ringing in the ears. From up and towards the south appeared a black swarm, and then another and another. 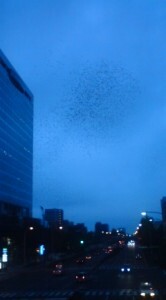 These were flocks of Grey Starlings (mukudori) coming to roost for the night around the Center. I was mesmerized by their interweaving which created visual effects more fascinating than any kaleidoscope or lava lamp. As the starlings started to settled into the trees, the noise more than doubled its volume and you could feel the soundwaves vibrating against your body. Then, suddenly, another sound rose up above the rest of the din. It was extremely loud and could only be described as NIGHTMARISH. l imagined some huge beast being tortured. What this was was the man from the city office trying to scare away the flocks of starlings. He was doing this by blasting the recorded sound of the starlings distress call. It was certainly distressing! The man doing it told me that it would take at least five evenings of doing this to get the birds to move somewhere else. The reasons that the people at the Center would want to have the birds move are easy to understand. 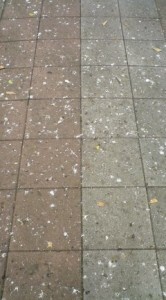 Besides the horrible racket the birds make, their droppings are prodigious and the ground along the pedestrian square area between the hotel and Nova Hall and then stretching towards the library was becoming pasty and difficult to maneuver. Anyway, this week I’ve still been able to enjoy watching the interweaving flocks. The birds have moved, but NOT VERY FAR! Now they are roosting in front of the Mitsui Building and behind the Lexus dealership. I’m sure that soon someone will call the city office to have the starlings chased away again. One more thing the boys at city hall might do is order the kind of tree-butchering which you have probably noticed (and cringed at) in Japan, which leaves only a miserable trunk. This is also an effective way of getting the starlings to roost somewhere else! Why do the starlings like to roost in the center of the city? I guess it makes them feel safe. They must also prefer to be in trees neatly lined up in a row. I always enjoy reading your entries and admire the beautiful pictures you take and submit to Tsukublog, but I must say, you have outdone yourself today! I cackled aloud several times throughout the entry and the snapshot of the birdy poop is classic. Keep ’em comin’!